I reeeeeeeally like sugar. In all forms. Candies/cookies/ice cream and chewy/hard/crunchy/smooth. Sugar puts me in a happy place. Sounds like an addiction. I know. But sometimes I eat so much of it (especially holiday time) that I get so sick of it and go to bed, patting my poor belly, and think, “I will never eat sugar again”. “Ever.” Well, a few days later, and my sugar cravings are back to their old tricks. I fall in love with sugar all over again. Dang. That’s how I feel about ruffles. I love, love, love them and use them here, there, and everywhere. And after overdosing on them, I swear I’m never going to use another ruffle. All it takes is a few days, and I can’t keep my fingers from gathering up a new row of ruffles. Anyone need sugar or ruffle therapy? Let’s go together. However, I don’t think I will ever truly rid myself of either. Oh, by the way……..today is all about ruffles. Yay! Blame the addiction. to make a new skirt. This stuff really gives a great punch of texture to your wardrobe. I’m kind of crazy about it. But you already knew that. What’s not to love? Basically, you’ll be sewing a piece of this ruffle fabric into a tube and putting an elastic band at the top. So, because the fabric comes in 40-45 inch widths, you’ll need to decide how ruffly you want the skirt. If that’s big enough of a width for you, then you’ll just need to buy enough of the length that you want. If you want it any bigger around, you’ll need to buy twice the length that you need. So if you you want your skirt to be 22 inches long and need more than 40 inches around, you need to buy 44 inches in length. Make sense? My skirt is 25 inches long, so I needed at least 50 inches of length (because I needed mine bigger than 40 inches around to create a good gather) so I ordered I used just under 1.5 yards and had scraps left over. Sew your two pieces together at the sides, with right sides together, with a 1/2 inch seam allowance. Make sure that you match up the ruffles as you’re sewing down the sides. Gather evenly, so that it’s the same width as your elastic. Then pin the skirt, while it’s inside out, to the “wrong side” of the elastic. Now, turn right side out and slip right in. I love this! It couldn't be any easier, either! I, too, have a ruffle (and sugar) addiction. Love em. 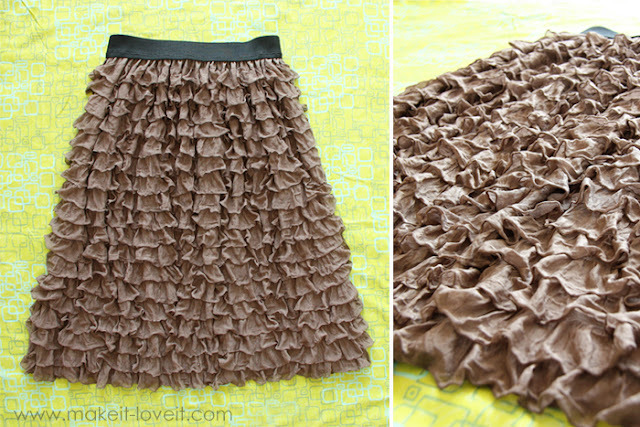 I'm sooo glad you're sharing all of these ruffle fabric tutorials! I purchased a ton at quilt market and need to get busy sewing! Thank you for the inspiration and the great link! The ruffle fabric website opens up so many possibilites. I think a ruffled pillow would be fun to try. Very girly!! Love it!! I made a small version for my 1 year old using cotton ribbing as the waist band, but I like how you used the elastic. I hadn't though of that. I'm making one of these for me soon :) Thanks for sharing! And I agree with Sarah, a pillow would be gorgeous done in the ruffles. you're going to send me on a ruffle frenzy with all these cute clothes! I love it! I'm so making one. Sooo cute! Sooo easy too! I am making this and the maxi dress for my post-pregnant with twins body this summer. And I also love it cause I'm tall and can make it the length I want! Thank you! How much fabric did you use? I want to buy some but don't know how much! This is so easy it's scary! LOVE! I think I'm getting addicted to the ruffles. I sure wish I could afford it! What is the name of the brown ruffle fabric you used? I am really getting into ruffles right now.. And I absolutely love this skirt!! Great job! So cute! My 21 yr old daughter purchased a skirt like this (much shorter of course!) from Urban Outfitters a couple of years ago. Hers has a slight A-line shape at the side seams which makes it fit nicely over the hips but still looks like a straight skirt. Tip – you may want to remove the basting/gathering stitches after sewing on the elastic so the ruffled skirt part can stretch with the elastic. I love this tutorial and the link for the ruffled fabric – I have not seen that before -thank you! Oh, and I needed about 1.5 yards to make mine long enough. But some of you may be able to get away with a yard……or even less if you're pretty small around the waist. I added more info in the tutorial to explain how much you'll need. Thanks! *sigh* So cute! I need to start sewing again. I have busied myself with other "sewing" projects and have neglected clothing all together! I love all you easy tutorials. Your creations are awesome. But I have one request…I would like to see the cloths you make for you ON YOU. Your maniquin is cute but I want to see them on a real body. Just a thought. Thanks! Brilliant and beautiful and I love that site! Bookmarked!! I love that we both have new babies and the same sugar addiction. This simple, cute skirt will help me bridge the gap until my pre-prego skirts fit again. :) Thanks! This is seriously THE cutest skirt I’ve ever seen! I want! I am in LOVE with this tutorial!!! I’m off to buy my own ruffle fabric to fulfill my ruffle addiction! =) Thanks for the great idea! Thanks for the little tips! I have recently started sewing like an addict, but am pretty much self taught so I am learning along the way. I love the tip to sew with a zigzag stitch and pull out the basting stitches. I recently made a simple skirt out of jersey knit and the stitches in the hem broke, I am wondering if I should have used a zigzag stitch to allow it to stretch. So beautiful! I think it’s the perfect summer skirt. This is perfect for my maturnity belly…I’m in need of some cute skirts and the easier the better! Question about the sewing the elastic to the skirt. If you have gathered the skirt and are using a zig zag stitch, do you have to pull the elastic while you are stitching and just run over it like a normal straight stitch. I just started sewing and bought some of this fabric to play with, but the elastic part eludes me! Nope, you don’t have to stretch the elastic……as long as you use a zig-zag stitch. Because after sewing it on and then stretching it, the zig-zag will stretch too. Make sense? Good luck! After wondering how I was going to get the ruffles to line up along the seam, I discovered another idea from the ruffle fabric tutorials that suggested serging the seam before sewing the pieces together….genius! That way all the ruffles stay in place when sewing :) HTH someone else out there! I never knew that about zig zagging on the elastic to allow it to stretch…how awesome!!! Thanks so much, can’t wait to try it!! Thank you for the fantastic tutorial! My skirt came out perfect! I am so in love with your site!!!! Absolutely amazing and so talented. Definitely have inspired me to think outside the box! Keep it up and thanks! Hey Ashley,I was wanting to make a long skirt (35in.) could you possibly HELP me?? wondering if it would be possible and how much it will require to make?THANKS so MUCH!! I LOVE this skirt. Thank you for posting this. I’m a beginner, so this is very helpful. I saw this exact skirt being sold at Free People For an insane amount, about $198.00. It’s called the Lydia Maxi skirt. The only difference is that theirs is longer. I was tempted but now that I’ve found your tutorial I can just make it myself. Thank you so much! I ordered the black ruffle and it’s still a tad see through. What would I use to line this that wouldn’t create a lot of bulk? thanks!